Of this edition of the Greek Testament, Michaelis remarks, that “the infancy of criticism ends with the edition of Gregory, and the age of manhood commences with that of Mill.” This work is undoubtedly one of the most magnificent publications that ever appeared, and ranks next to that of Wetstein, in importance and utility. It was published only fourteen days before his death, and had been the labour of thirty years. He undertook it by the advice of Dr. John Fell, bishop of Oxford; and the impression was begun at his lordship’s charge, in his printing-house near the theatre. But after the bishop’s death his executors were not willing to proceed; and therefore Dr. Mill, perhaps hurt at this refusal, and willing to shew his superior liberality, refunded the sums which trie bishop had paid, and finished the impression at his own expence. 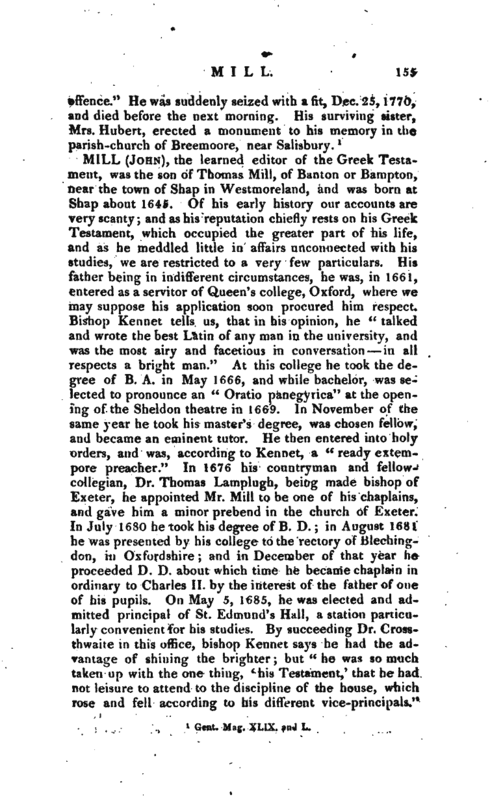 The expectations of the learned, foreigners as well as English, were raised very high in consequence of Dr. Mill’s character, and were not disappointed. 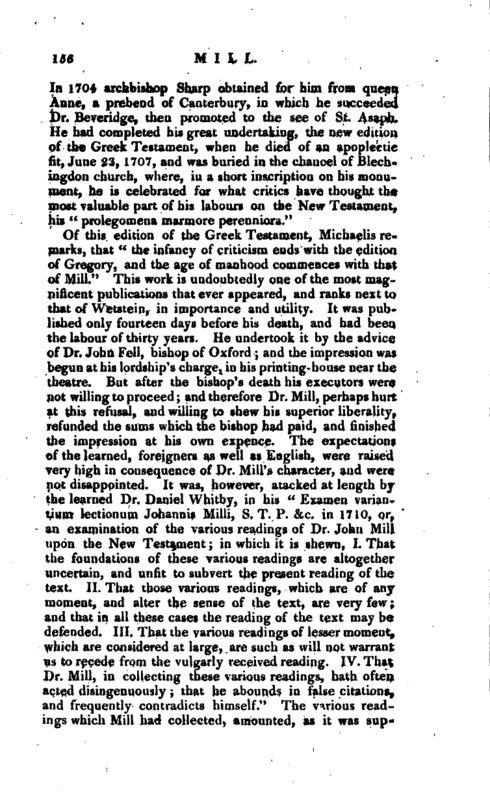 It was, however, atacked at length by the learned Dr. Daniel Whitby, in his “Examen variantium lectionum Johannis Milli, S. T. P. &c. in 1710, or, an examination of the various readings of Dr. John Mill upon the New Testament; in which it is shewn, I. That the foundations of these various readings are altogether uncertain, and unfit to subvert the present reading of the text. II. That those various readings, which are of any moment, and alter the sense of the text, are very few; and that in all these cases the reading of the text may be defended. III. That the various readings of lesser moment, which are considered at large, are such as will not warrant us to recede from the vulgarly received reading. IV. 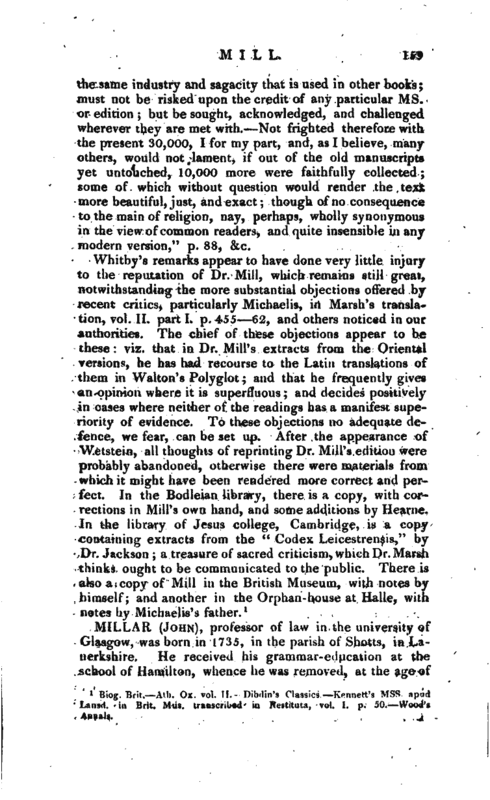 That Dr. Mill, in collecting these various readings, hath often acted disingenuously; that he abounds in false citations, and frequently contradicts himself.” The various readings which Mill had collected, amounted, as it was | supposed, to above 30,000; and this alarmed Dr. Whitby, who thought that the text was thus made precarious, and a handle given to the free-thinkers; and it is certain that Collins, in his “Discourse upon Free-thinking,” urges a passage out of this book of Whitby’s, to shew that Mill’s various readings of the New Testament must render the text itself doubtful. 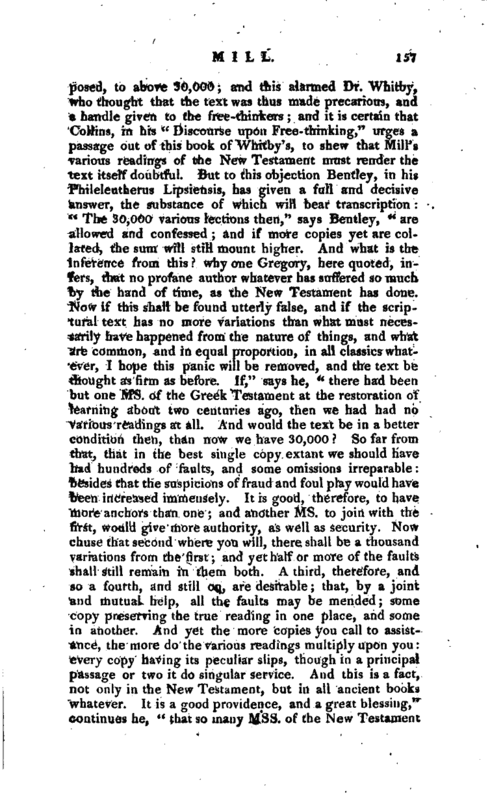 But to this objection Bentley, in his Phileleutherus Lipsiensis, has given a full and decisive answer, the substance of which will bear transcription “The 30,000 various lections then,” says Bentley, “are allowed and confessed and if more copies yet are collated, the sum will still mount higher. And what is the inference from this? why one Gregory, here quoted, infers, that no profane author whatever has suffered so much by the hand of time, as the New Testament has done. Now if this shall be found utterly false, and if the scriptural text has no more variations than what must necessarily have happened from the nature of things, and what are common, and in equal proportion, in all classics whatever, I hope this panic will be removed, and the text be thought as firm as before. If,” says he, “there had been but one ms. of the Greek Testament at the restoration of learning about two centuries ago, then we had had no various readings at all. And would the text be in a better condition then, than now we have 30,000 So far from that, that in the best single copy extant we should have had hundreds of faults, and some omissions irreparable: besides that the suspicions of fraud and foul play would have been increased immensely. It is good, therefore, to have more anchors than one; and another ms. to join with the first, would give more authority, as well as security. Now chuse that second where you will, there shall be a thousand variations from the first; and yet half or more of the faults shall still remain in them both. A third, therefore, and so a fourth, and still on, are desirable that, by a joint and mutual help, all the faults may be mended some copy preserving the true reading in one place, and some in another. And yet the more copies you call to assistance, the more do the various readings multiply upon you: every copy having its peculiar slips, though in a principal passage or two it do singular service. And this is a fact, not only in the New Testament, but in all ancient books whatever. It is a good providence, and a great blessing,” continues he, “that so many Mss. of the New Testament | are still among us; some procured from Egypt, otheri from Asia, others found in the Western churches. For the very distances of the places, as well as numbers of the books, demonstrate, that there could be no collusion, no altering or interpolating one copy by another, nor all by any of them. In profane authors, as they are called, whereof one ms. only had the luck to be preserved, as Velleius Paterculus among the Latins, and Hesychius among the Greeks, the faults of the scribes are found so numerous, and the defects so beyond all redress, that notwithstanding the pains of the learnedest and acutest critics for two whole centuries, these books still are, and are like to continue, a mere heap of errors. On the contrary, where the copies of any author are numerous, though the various readings always increase in proportion, there the text, by an accurate collation of them, made by skilful and judicious hands, is ever the more correct, and comes nearer to the true words of the author. It is plain, therefore, to me, that your learned Whitbyus, in his invective against my dead friend, was suddenly surprised with a panic; and under his deep concern for the text, did not reflect at all, what that word really means. The present text was first settled almost 200 years ago out of several Mss. by Robert Stephens, a printer and bookseller at Paris; whose beautiful, and, generally speaking, accurate edition, has been ever since counted the standard, and followed by all the rest. Now this specific text, in your doctor’s notion, seems taken for the sacred original in every word and syllable; and if the conceit is but spread and propagated, within a few years that printer’s infallibility will be as zealously maintained as an evangelist’s or apostle’s. 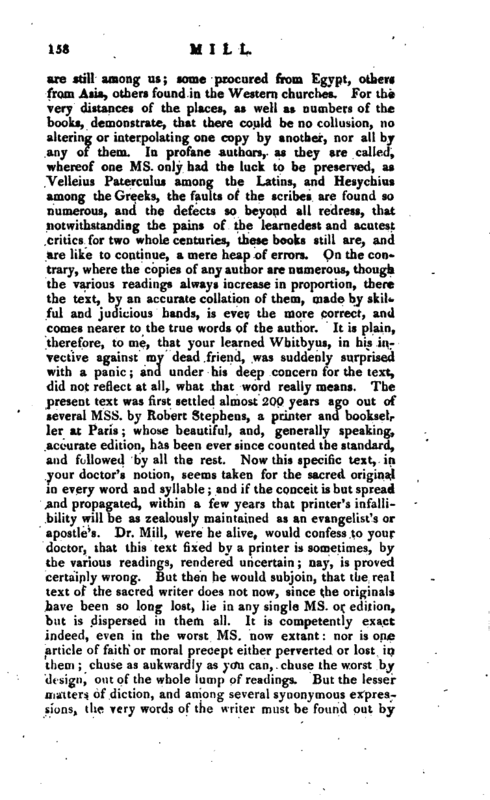 Dr. Mill, were he alive, would confess to your doctor, that this text fixed by a printer is sometimes, by the various readings, rendered uncertain; nay, is proved certainly wrong. But then he would subjoin, that the real text of the sacred writer does not now, since the originals have been so long lost, lie in any single ms. or edition, but is dispersed in them all. It is competently exact indeed, even in the worst ms. now extant: nor is one article of faith or moral precept either perverted or lost in them; chuse as aukwardly as you can, chuse the worst by design, out of the whole lump of readings. But the lesser matters of diction, and among several synonymous expressions, the very words of the writer must be found out by | the same industry and sagacity that is used in other books; must not be risked upon the credit of any particular ms. or edition; but be sought, acknowledged, and challenged wherever they are met with. Not frighted therefore with the present 30,000, I for my part, and, as I believe, many others, would not lament, if out of the old manuscripts yet untouched, 10,000 more were faithfully collected; some of which without question would render the text more beautiful, just, and exact; though of no consequence to the main of religion, nay, perhaps, wholly synonymous in the view of common readers, t and quite insensible in any modern version,” p. 88, &c.
1 Biog. Brit. Atli. Ox. vol. 11.- Dibdin’s Classics. Konnett’s Mss L-insd. in Brit. Mus. transcribed in Kestituta, vol. I. p. 50. Wood’s Annals.